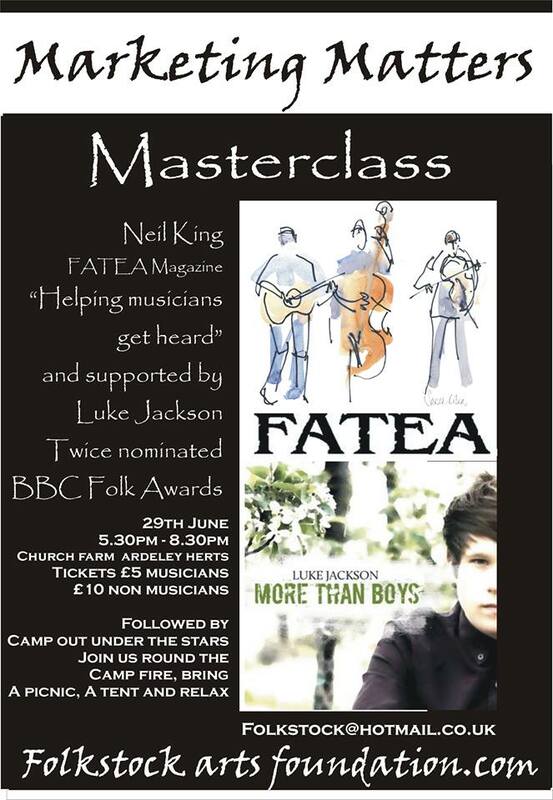 Eighteen year old nominee of two BBC Radio Folk awards, Luke Jackson, was on hand at the marketing matters seminar to share his song writing experiences and woo the audience with his flawless performances. Although, nowadays, Luke can usually be found performing at large gigs, he said he was glad to have the opportunity to talk about his career so far and reflect on where his songs have come from. Like many artists starting out, Luke began with mostly performing covers. He would perform to audiences at every opportunity given. He recalls being 14 years old and performing in smoky pubs, where it’s possible that he was the only person there below the age of 50. “I tried to get my head in as many places as possible, all the open mic nights, etc. Back then I did pub gigs for a long time, but now I tend to avoid pub gigs – they love a cover, but I’m now picky because I want to perform my own stuff. But always start out with being everywhere!” he said. It was great to see an artist with such charisma (and modesty); Luke had the whole room hooked on his every word as he chatted about his journey as an artist and joked about the days he would “travel from Canterbury to Birmingham to gig in front of three people – two of which would be talking, and one was [his] dad”. He explained that at the start of his music career the social networking site MySpace was good for getting gigs, (where he would sell CDs for £3) but now social media sites such as Facebook and Twitter are more about communication with fans then getting gigs and selling. Inspired by acoustic great Richard Thompson OBE’s storytelling genius, Luke’s first album More Than Boys is about growing up – that’s where he is at in life, and he finds others can relate. He spoke of recording his album last year under Martyn Joseph’s record label – he wanted to make an album with a live feel and so using only a voice mic, a guitar mic and lots of takes, the album was cut in 4 days. Luke sang seven songs in total to the select crowd in the room (it was like having our own private gig) six of which were his own, original songs (including the title track of his debut album More Than Boys) and one being a cover of John Hiatt’s Icy Blue Heart. These were interjected with funny anecdotes about Luke’s friends, tour experiences and fellow artists – and how these have influenced his song writing. It was easy to believe Luke’s admission that he favours gigs not by number in attendance, but audience response, as he comfortably made eye contact around the room as he sang. It was fascinating to learn about the experiences that inspired each of the songs Luke had written. From writing ‘Out of Time’ while standing in St David’s Hall in Cardiff waiting for his encore at the end of a 6-week tour with Martyn Joseph (during which he lived off of Cornish pasties and sausage rolls from service stations) – to stumbling across the melody for ‘Last Train’ during a sound check at a Cambridge gig (lyrics followed the next day while watching an old war film), Luke explained that he can’t force a song. The session with Luke concluded with an audience Q&A. The things that stood out to me most over this were Luke’s thoughts on big labels and talent shows. Although he loves artists like Paolo Nutini and Ben Howard, and can see how a big label works for them as they continue to do their own thing, he admits that personally, he wouldn’t go mainstream if meant he had to compromise his own style. As far as X Factor type contests go? Luke wants to be around the music scene for a long time, and can’t see a sustainable career via TV talent shows. 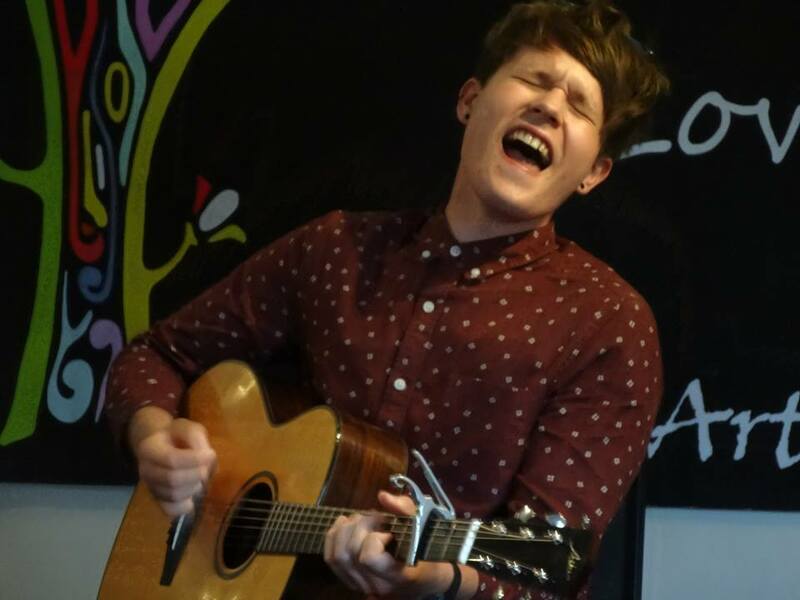 With that thought in mind as he graciously thanked Helen for inviting him to be there, I can see why Luke Jackson wanted to be involved with Folkstock from the beginning – and what a great person to have onboard! Marketing Matters – Mmm Hmm. In all the madness of job interviews and appointments this week (anybody want to hire me?) I had to make the journey to Ardeley from the depths of Norfolk. Although I have lived in Hertfordshire the last few years, I’ve rarely ventured further afield than Hatfield or St Albans so wasn’t sure what was in store at the end of this monstrous obstacle course of public transport – but I am so glad I made the effort to attend! I was able to get to St Albans via trains and buses, where the beautiful Lauren Deakin -Davies of The Folk (pictured left) let me hitch a ride the rest of the way. It was fascinating to revel in Lauren’s enthusiasm as she told me about how she’d given up her A Levels to pursue her dream of a music career when big record labels such as Island started showing interest. Although the pathway to her success has not yet been a smooth one for Lauren, her story reminded to stay hungry for success in my own career journey (but still, if you do want to hire me… 😉 ). We reached Ardeley (a village far more rural than I had expected) a little early, so I was able to stop off at the pub opposite the venue and chat to another of the musicians. Simon from Nick and the Sun Machine had bought his guitar along for the campfire acoustic jams, but told me he was here without the rest of his band, so any performances this evening would be his solo stuff. 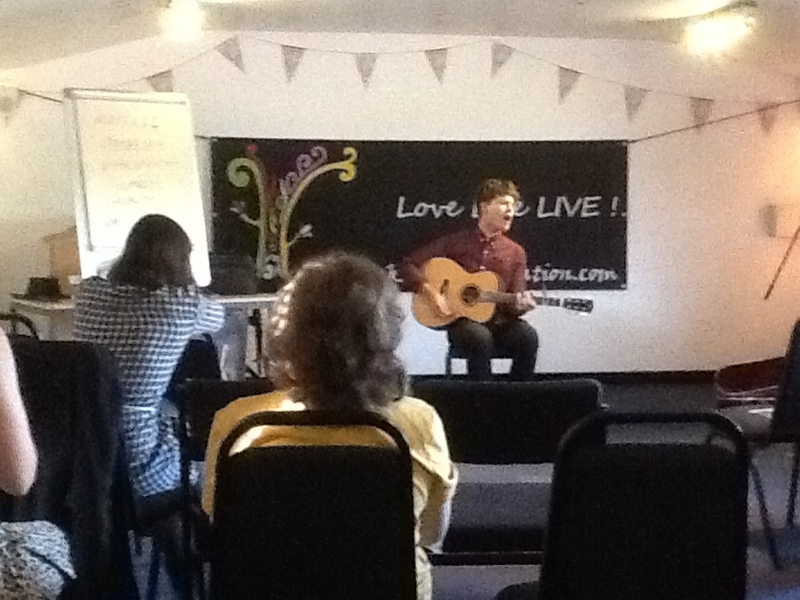 We enjoyed the summer vibe and enviously pooh-poohed Glastonbury (who needs Glasto when you’ve got Folkstock, anyway!) until it was time to move to the Church Farm barns to listen to Neil King’s seminar. 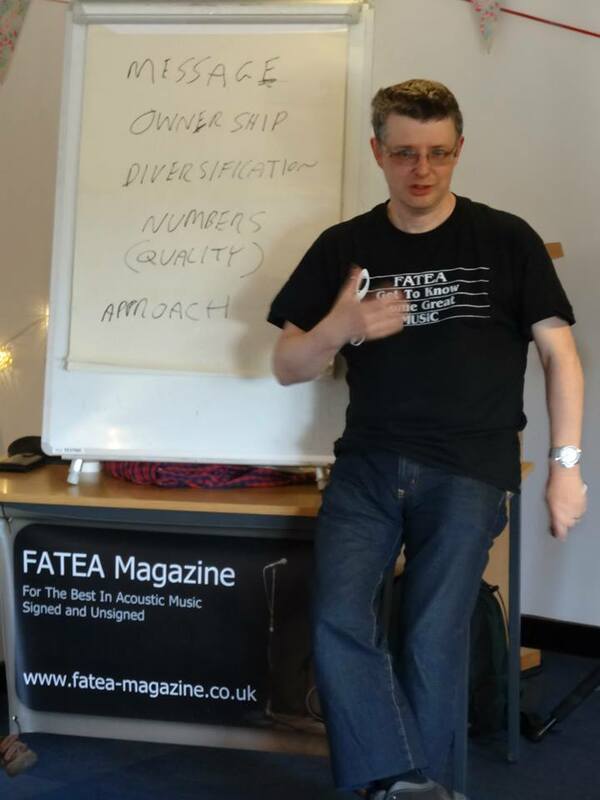 Music journalist and FATEA editor Neil King spent a good hour mentoring the musicians in the room about all things marketing. He explained that as a journalist he is used to being the one sitting in a chair taking notes, not the one up at the front talking – but if he was out of his comfort zone, it certainly didn’t show as he held the room’s attention for his master class on promoting albums. The big flip chart at the front of the room said the words: message, ownership, diversification, numbers (quality) and approach; which were the main themes of the discussion about the changing nature of the music industry, and henceforth the changing roles of new musicians. Neil explained that back in the 1980s record labels did all the work, but the main problem these days is that the role of what a musician should be doing is blurred. The rise of the Internet has meant that musicians are expected to be publishers and marketers and now have to understand needs and requirements of a fragmented media. Neil believes that as more and more radio stations and media outlets emerge, the traditional national media has collapsed. As more radio stations exist, audiences fragment meaning that national radio is no longer a place for new music. The average online radio station has only four listeners per hour, meaning that even if you started your own radio station and played your stuff on auto – you’d have the same chance of getting listeners as other new radio stations! Neil suggests budding musicians approach local or regional radio stations by research; local radio has space and time to fill – they are easy to approach if you approach the right way – research their style and music and send them the tracks that you think will suit them. Even if there are some tracks on your album that wouldn’t be in line with the station’s playlist, they don’t need to hear your whole album, pick and choose the songs you think are most likely to get played by each individual station. The best place to start in getting your songs played on the radio is by putting together a press kit of 2 or 3 tracks on a CD-R (don’t rely on just mp3 as people often still use CDs! 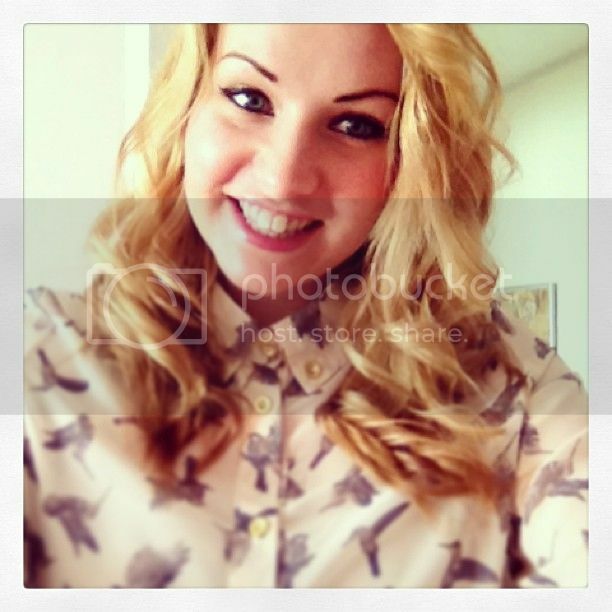 ), a photo and a blurb (for their website). Don’t have all your information on the CD sleeve only – as this may get thrown out to save storage space. 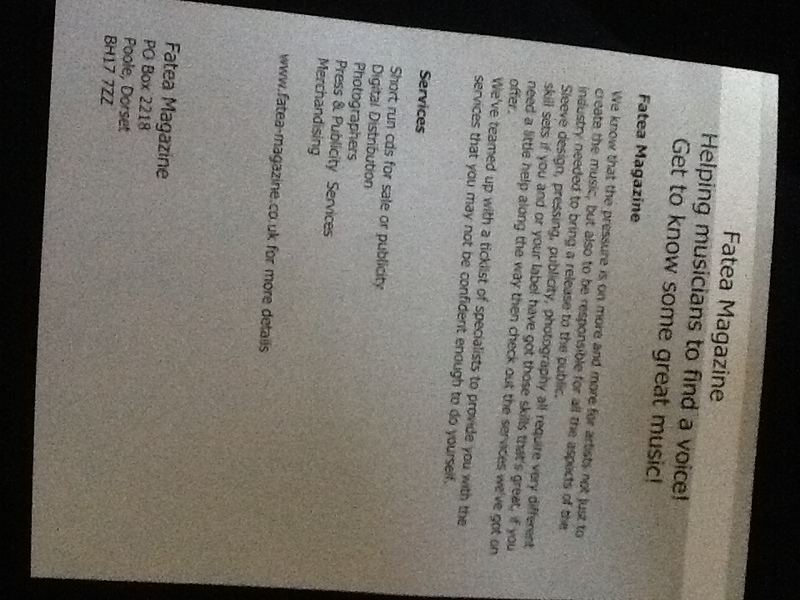 Neil’s expert tip is to also send the radio station an email beforehand to tell them it’s on the way and what format. 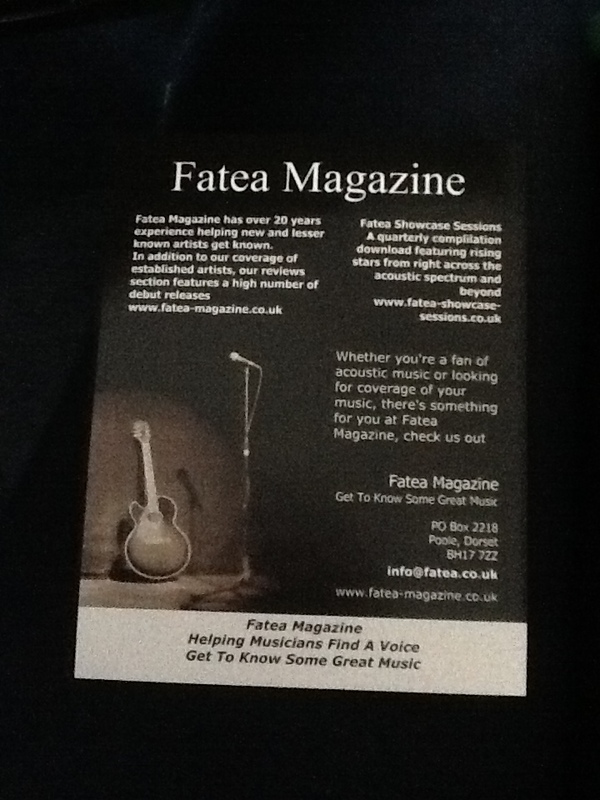 When it comes to local print/online media you need to market the whole package (make sure first 4 songs are the best – reviewers are lazy – hand it to them! ), Neil explained. “Give a breakdown of only 2 or 3 tracks – they don’t need to hear about the entire album – and this will focus your presence, and focuses their review of your album. The only way to get radios to make sure they are sending out a consistent message is to make sure you control it yourself”. Give a release date (send the album out no more than 2 weeks from either side of your release date), as it gives journalists a sense of immediacy, and may stop your CD going into ‘the pile’ by giving it urgency. Are you giving them exclusive? – Let them know! As Neil spoke about the way the Internet has dominated the music industry, through his discussion (with great audience participation), it was easy to see the implications that this has had. The Internet requires you to update regularly, as an artist you have to either do it yourself or find the correct people to do it for you (that’s where the Folkstock Foundation comes in!). Think about your message – is the message you are carrying to the media the message that they want to hear? “Focus on the here and now – if they find something else in your back catalogue, then that’s great, but don’t send them there! Make sure you are directing the press, if you don’t send them a whole package, they will Google you, and what they use may not be what you want them to use: It’s up to you to tell them what to use”, Neil said. What should you put on a press release? Start with who you are, what you are doing/selling and this is how we’re going to sell it to you and why you should be interested. A press release should be only one side of A4, and the title is the most important part – it determines whether or not the rest of your press release will be read. Save the journalist the hassle of writing (Neil says journalists are lazy – I must not have reached that stage in my career yet 😉 ) by handing them the key message: what you want them to play, when the album is out, who you are, etc. If you’re featured somewhere already, tell them that too. Neil surprised the room by telling us that even live reviews in newspapers or magazines, often come from bands themselves! Much to the amusement of the room, the question that had perhaps been on everyone’s mind was asked; “how modest should you be if you’re reviewing yourself?” after the chuckles in the room, Neil’s advice was to “be realistic” or if you aren’t sure, get an audience member you know, or an artist you have supported to write it – to be on the safe side. Neil pointed out that “your ownership expands past your music. Your marketing presence is also your website, Twitter and Facebook, but focus on your website!”. Neil’s message was to not just depend on a Facebook page and receiving ‘Likes’ on it; “don’t drive content via your social media – look how MySpace fell! People prioritised MySpace, put their MySpace URL on their albums sleeves, etc. and then its popularity fell”, Neil said. Neil’s other top tips for your web space is to create a website in blog style with the newest stuff at the top. He suggests to be personal: talk to your network through your website (can you get the details of the people that come to your website?) and don’t direct people to iTunes and Amazon, direct to your website! If you can you sell through your website, then you get a higher percentage of the payment than if you were to sell via iTunes. Network, network, network! Was the final key message we were left with. Building up contacts means building up a marketing base, and collaborating with other local artists means you can help promote each other. 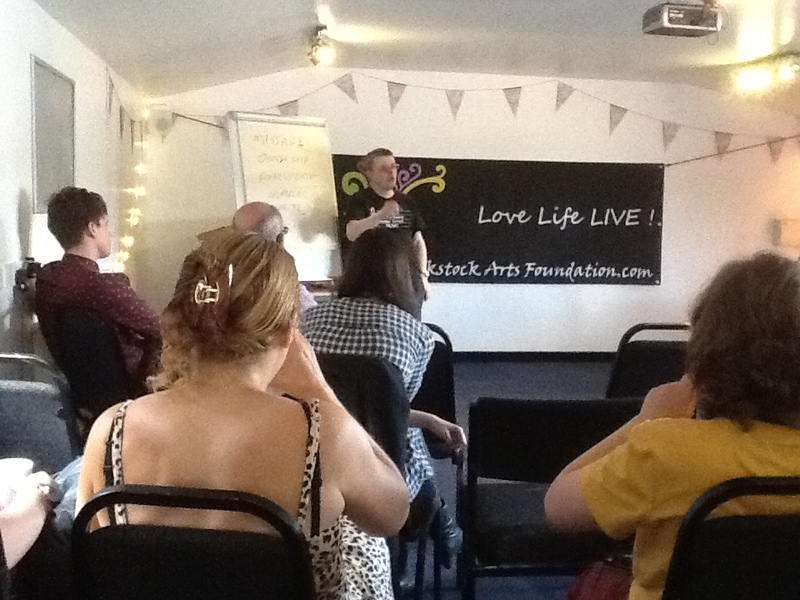 (SEE, THIS IS WHAT FOLKSTOCK FOUNDATION IS ALL ABOUT!). Don’t be put off by the numbers of people attending gigs or buying albums; lower numbers of passionate fans is better than mass that aren’t dedicated! Finally, despite all the talk of internet marketing, it doesn’t hurt to go back to marketing basics – flyer at every gig that you do – it is still a way to get people to come back to you. Even if screwed up in someone’s pocket, still a chance they will come back to it and find you!